I loved my birthday! I got a “my little pony Bow tie”! I also got this diary! I got paper and art Kit! The favors were lovely! Necklaces were from Ben. And 35c! I also got a new pink dress from Mama and Papa! That evning we ate pie for desert! Then I got more presents! Some white gloves, three Debbie books, and some clothes for Jill! Here we are in 2010, and I’m 32, which is older than I could possibly have imagined being in 1985. 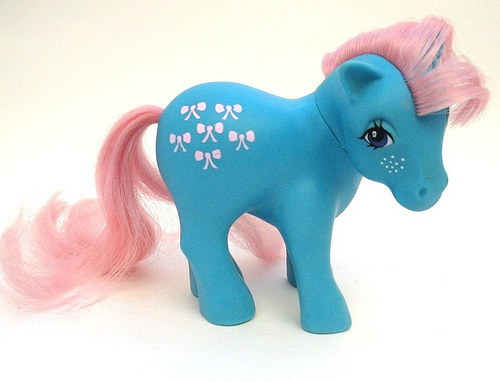 “My Little Ponies” are popular once again. This is totally her, Bow Tie. But mine had better hair. That first diary (mostly white with a photo of a pretty girl at a window with flowers in her hair, gold writing on the front reading “one year diary”) is fragile and falling apart. Thirty-five cents might buy you a few gummi worms. I still remember that pink dress: dotted swiss with a wide white collar, the most beautiful dress in the universe. Also, the desire I had for those white gloves was potent: when I got them, it was a dream come true, and when I put them on, I felt like the most grown-up and sophisticated brand-new seven-year-old possible. And Jill (Gilbertina Jill, actually) was my Cabbage Patch Kid. Her birthday was October 1st. This morning, I woke up to E gently (maybe he’s finally learning from when I say “Gentle!” all the time) touching my eyelid to get it to open. For my birthday, he gave me a zerbert. I haven’t changed a diaper at all today… we had brunch at With the Grain… we played Settlers… Sean’s boss, who is one of those extra-nice people, made a gorgeous butterfly-shaped cake for me… my hubby is at this moment cleaning the kitchen… it’s a day in the company of people I love… What more could I possibly ask for? Haha! I noticed that too! It is kind of funny!